The PIC32 needs to decode the waveform audio format (WAV) files read from the flash drive. 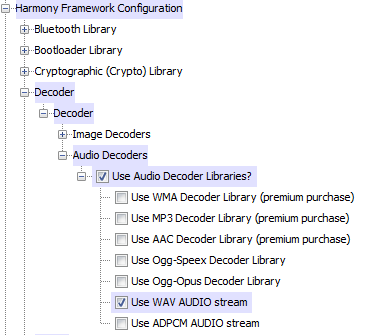 Expand the Harmony Framework Configuration > Decoder > Decoder > Audio Decoders selection tree. Check the Use Audio Decoder Libraries? box. Check the Use WAV AUDIO stream box. Yes, this is all that is needed in order to add decoder functionality!